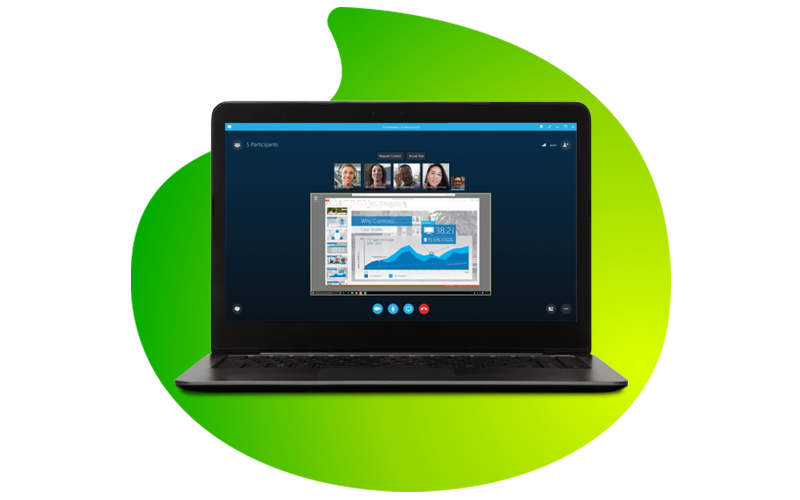 Skype for Business is a communication tool that enables you to connect with co-workers around the world. Perfect for businesses with more than 20 employees, it allows you to connect with others via instant message, video and voice calls, and with the added presence feature you are able to see if someone is available, in a meeting, or presenting. Licensed as a stand-alone product or as part of the Oﬃce 365 application suite, Skype for Business has a broad catalogue of cloud, network, mobile, management and service capabilities that are brought together to allow sharing of information through voice, video and instant messaging. Local provider, providing VoIP solution. Call queues that send incoming calls to a customer support agent in the order they are received. Cloud Private Branch Exchange (PBX) capabilities. File sharing, whiteboarding, and screen and app sharing. Records and archives meetings, messages, conferencing sessions and sign-in logs. sign off ensures secure archiving. Custom and automated presence based on Outlook calendar or out-of-office status. time and streamline your organisation.